LED T8 EZ4 replacement light bulbs in 5000K light color can operate on T8 instant start electronic ballasts OR T12 magnetic 2 lamp ballasts OR 120/277 volt AND AC single or double end power. Now you have a choice as you retrofit existing light fixtures without worrying about which lamp to use, this one truly has it all covered. It's the ultimate flexible LED tube light bulb for any lighting situation. 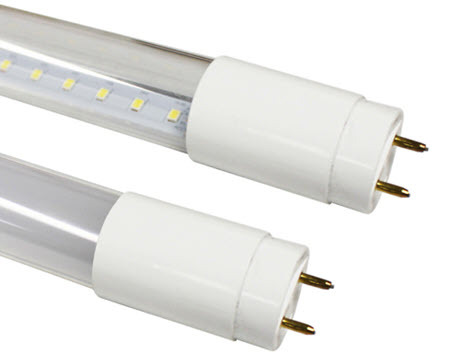 This is the easiest, most cost-effective way to upgrade fluorescent linear lighting to more efficient LED 4 foot tubes. For those of you who are unsure whether the LED light bulbs you need will work in every situation that you have, this might be the solution for you. This particular light bulb works on nearly everything that you may have whether it's an instance start ballast or direct wiring. It's a perfect way to have the best of all possible worlds when it comes to an energy saving replacement. Its high-quality and sophisticated electronics make it possible to do this and come with a five-year warranty. If you're unsure whether it will work for you, you can always give us a call and we can help you determine that. There are situations where some people want to start off with a basic retrofit, without any rewiring with the potential to change that down the road. With this type of LED light bulb, you don't ever have to buy another light bulb to do another retrofit task. 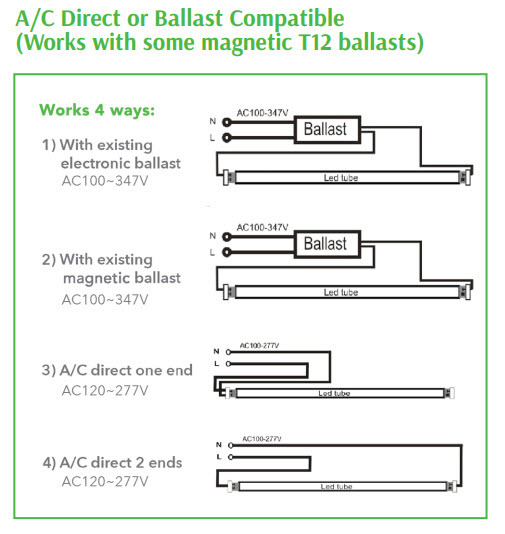 For some people, they will simply replace the bulb to operate on an instant start ballast and as though starting to fail, don't do the rewire to directly 120 or 277 volts. It's one way to make a flexible investment to make sure your future proof of any changes that might come to no matter what kind of lighting system you may have right now. 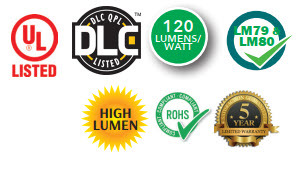 These are DLC listed so they qualify for most utility rebate programs that you may have in your area.